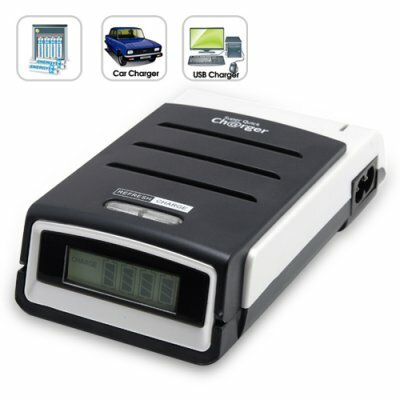 Successfully Added Battery Charger with LCD Screen to your Shopping Cart. Battery Charger with LCD Screen - The easiest way to check the condition of your AA and AAA batteries and keep them fully charged for when you need them. This Battery Charger allows you to charge your batteries through the AC adapter as well as your car's lighter socket and USB charging, so you can charge at home, in the office, or even on the go. The compact size and shape also makes it ideal to use and carry around everywhere. This Battery Charger is designed to recharge rechargeable Ni-MH and Ni-Cd batteries only. Please make sure your batteries are able to be recharged before using this product.